One of the planets largest problems is the amount of waste that the human race produces, it is a well-known fact that most of the plastic ever produced is still in existence today. Plastic waste is a huge problem in our oceans, it pollutes the natural living environment of marine life resulting in plastic entering the food chain and ultimately becoming part of our diet. Medserv Cyprus has set a target to reduce waste during 2019. One of the ways we will achieve a significant reduction is to stop the use of single use plastic and paper cups. These single use cups are currently in use in our kitchens and canteens, creating a large amount of waste that can easily be reduced by introducing reusable cups. 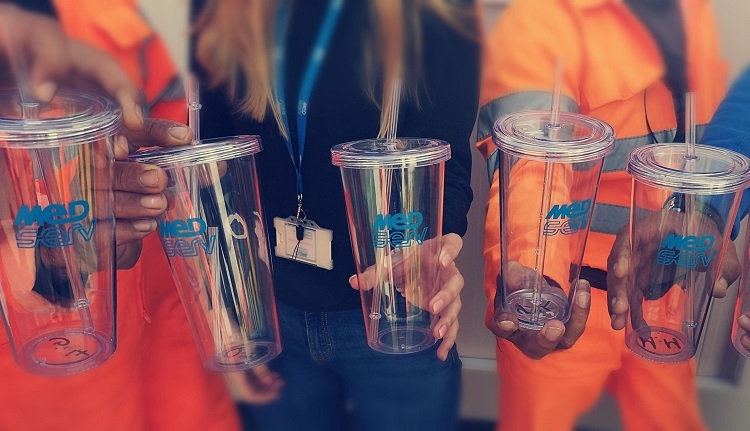 Medserv has already issued reusable water bottles and coffee cups, today we are issuing the team with reusable frape cups with reusable straws.